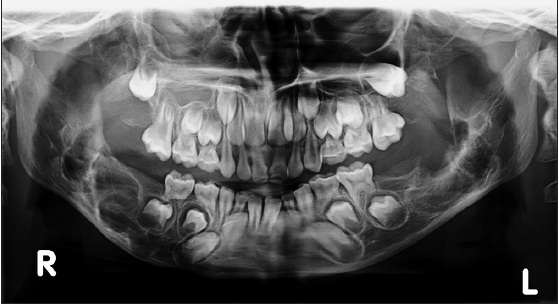 Cherubism is an uncommon fibro-osseous disorder of the jaw that presents with varying degrees of involvement and tendency towards spontaneous remission. Children are normal at birth and the expanding jaw is noticed within the first year of life becoming progressively larger until the beginning of adolescence. Lesions are characterized by replacement of bone with fibrovascular tissue containing abundant multinucleated giant cells. Here, we describe a case of cherubism in a 4-year-old child with swelling on both sides of mandible with clinic radiographic features and suggestions for therapy. Seward and Hankey (1957)  suggested a grading system for cherubism. 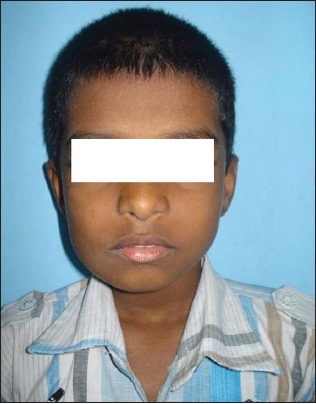 A 4-year-old boy presented with painless bilateral swelling of the mandible. When the boy was about 2 years old, the parents had noticed a change in facial symmetry of the face, which later on became more marked [Figure 1]. Intraorally the alveolar ridges were swollen at the angle region and were firm on palpation. Patient had moderate bilateral submandibular lymph node enlargement. Physical and mental development was normal. Patient's parents are healthy had no siblings and none of their relatives had facial deformities. Radiographically, the mandible showed a multilocular radiolucency with thin and expanded cortices, including the body and posterior rami bilaterally. The condyle and the condylar neck appeared normal. Maxilla was not involved. The second permanent molar bud was missing considering the age. Radiographically and clinically, symmetric involvement was evident [Figure 2]. CT scan revealed expansile remodeling with multiple osteolytic areas in the mandible [Figure 3]. Laboratory tests, which included serum calcium, phosphorous, alkaline phosphatase and parathyroid hormone were normal. Biopsy from the central area of both right and the left rami were taken. 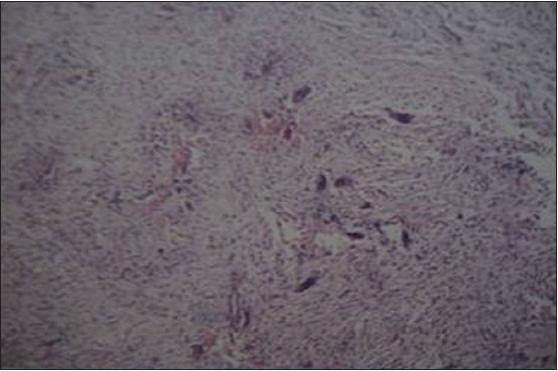 Histopathological examination showed fibrovascular collagenous connective tissue with dispersed giant cells [Figure 4]. Patient was recalled after 4 years and patient was asymptomatic; however, the facial asymmetry was evident [Figure 5]. 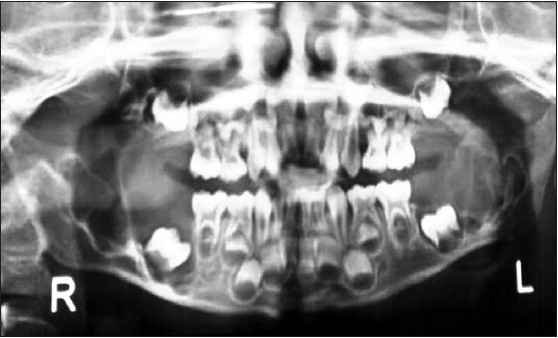 Follow-up orthopantomogram also showed multilocular radiolucencies within the posterior body and rami of mandibular region bilaterally [Figure 6]. As the condition tends to resolve around 15 years of age, patient is kept under periodic follow-up. Syndromes related with cherubism are Ramon syndrome (Cherubism, short stature, mental retardation and gingival fibromatosis), Noonan syndrome (dysmorphic features, developmental delay, short stature, mild mental retardation, cardiac anomaly, pulmonary stenosis, cryptorchidism in males and giant-cell lesions of bones and soft-tissues). This case lacked significant findings, which were suggestive of any known syndromes. 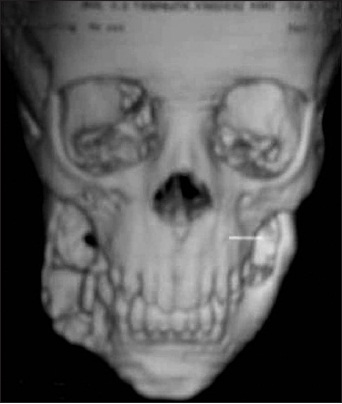 Isolated single cases of cherubism have been reported in the literature, most of them based on history reported by the affected family members, who had not noticed any facial alteration in other relatives. In our non-familial case, beyond the history provided by the patient's parent, we observed close relatives for cherubic features; however, we could not find any. Our case falls into grade - 1 category since only body of the mandible and rami were involved. Various studies indicate that the state of normalization is reached faster in patients of grade - 1 than of higher grades of cherubism. Condyle was not involved and this was in accordance with various literatures. In general, cherubism does not involve other parts of the skeleton or the bone metabolism, because the biochemical bone markers serum calcium, phosphorus and alkaline phosphatase have been found within the normal ranges with respect to age. Immunohistochemistry characterization of multinucleated giant cells reveals that these are osteoclasts since they are positive for tartrate resistant acid phosphatase. Immunohistochemistry was not done in our case. Recommended therapy ranges from radical surgical removal to an attitude of wait and watch. The general clinical approach is to avoid surgery altogether and allow natural involution to take place or defer surgeries until after puberty. If osseous contouring is required because of pain or psychological needs, it is done with the knowledge that the operated bone will re-expand at the same or may accelerate the rate of expansion, but the limited experience with surgery on these patients does not support this concern. Based on the genetic mutations related to the disease, gene therapy is expected to play a role in future treatment. 1. Hyckel P, Berndt A, Schleier P, Clement JH, Beensen V, Peters H, et al. Cherubism-new hypotheses on pathogenesis and therapeutic consequences. J Craniomaxillofac Surg 2005;33:61-8. 2. Carvalho Silva E, Carvalho Silva GC, Vieira TC. Cherubism: Clinicoradiographic features, treatment, and long-term follow-up of 8 cases. J Oral Maxillofac Surg 2007;65:517-22. 3. Mangion J, Rahman N, Edkins S, Barfoot R, Nguyen T, Sigurdsson A, Townend JV, Fitzpatrick DR, Flanagan AM, Stratton MR: The gene for cherubism maps to chromosome 4p16.3. Am J Hum Genet 1999;65:151-7. 4. Tiziani V, Reichenberger E, Buzzo CL, Niazi S, Fukai N, Stiller M, Peters H, Salzano FM, Raposo do Amaral CM, Olsen BR: The gene for cherubism maps to chromosome 4p16. Am J Hum Genet 1999;65:158-66. 5. Ueki Y, Tiziani V, Santanna C, Fukai N, Maulik C, Garfinkle J, et al. Mutations in the gene encoding c-Abl-binding protein SH3BP2 cause cherubism. Nat Genet 2001;28:125-6. 6. Shafer WG, Hine MK, Levy BM. Diseases of bone and joints. A Textbook of Oral Pathology, 4 th ed. Philadelphia: W.B. Saunders Company; 1997. p. 701-2. 7. Marx RE, Stern D. Fibro-osseous diseases and systemic diseases affecting bone. Oral and Maxillofacial Pathology: A Rationale for Diagnosis and Treatment, 1 st ed. Illinois: Quintessence Publishers; 2003. p. 744-5. 8. Seward GR, Hankey GT. Cherubism. Oral Surg Oral Med Oral Pathol. 1957;10:952-74. 9. Von Wowern N. Cherubism: A 36-year long-term follow-up of 2 generations in different families and review of the literature. Oral Surg Oral Med Oral Pathol Oral Radiol Endod 2000;90:765-72. 10. Raposo-Amaral CE, de Campos Guidi M, Warren SM, Almeida AB, Amstalden EM, Tiziane V, et al. 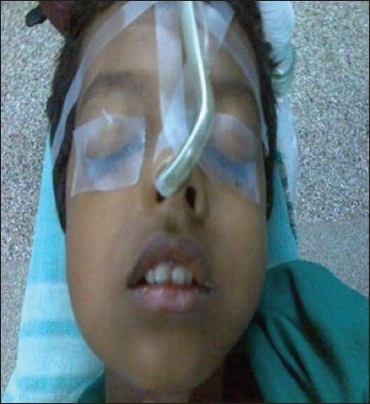 Two-stage surgical treatment of severe cherubism. Ann Plast Surg 2007;58:645-51. 11. Peñarrocha M, Bonet J, Mínguez JM, Bagán JV, Vera F, Mínguez I. Cherubism: A clinical, radiographic, and histopathologic comparison of 7 cases. J Oral Maxillofac Surg 2006;64:924-30. 12. Meng XM, Yu SF, Yu GY. Clinicopathologic study of 24 cases of cherubism. Int J Oral Maxillofac Surg. 2005;34:350-6. 14. de Lange J, van den Akker HP, Scholtemeijer M. Cherubism treated with calcitonin: Report of a case. J Oral Maxillofac Surg 2007;65:1665-7.